The conservatory-trained Anouar Brahem has deep respect for traditional music, but he’s also a modernist who assimilates classical and jazz influences, writes for film and dance and has helped push the oud (Arabic lute) from an ensemble role into center stage. 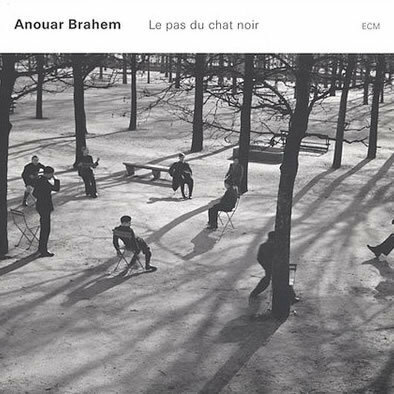 Le Pas du Chat Noir (ECM) is the latest by the Tunisian oud virtuoso, but Brahem composed much of this new disc at the piano. In many respects this is music revealed rather than made, and it’s suitable for study and meditation as well as listening for pleasure. Brahem’s oud blends beautifully with French pianist Francois Courturier and accordionist Jean-Louis Matinier, and this trio knows how to listen and breathe together, demonstrating that space is as much a part of music as the notes. It’s not all contemplative, however: there’s the pulse-quickening oud and accordion duet “Pique-Nique a Nagpur” and the intertwined piano and oud chase on “De Tout Ton Cour.” Courturier also gets an interesting hammer-dulcimer effect from the piano on “C’est Ailleurs,” while the accordion plays a mysterious drone on “L’arbre Qui Voit.” Those with a short attention span might complain that this music doesn’t go anywhere. But the point is this music is already there; you just need to listen.